It's getting hard to ignore Roku's effect on the home electronics market. Not only does the company make a wide variety of devices that can turn your dumb TV into a smart TV, but the technology is showing up built right into many TV's these days. Clearly, the company must be doing something right – or at least something that consumers like – with its products. And, though it isn't a completely brand-new addition to their product line, the company is offering an upgraded version of their entry level "Streaming Stick" with the Streaming Stick+, which ups the tech ante from the base unit quite nicely. It also ups the price from the base unit, which should surprise no one, but for its retail price of $89.99 CAD, it's a pretty compelling addition to a TV – even a smart one because there are a lot of apps you can get from Roku (including its own Roku channel) that don't come on the garden variety smart TV. The Streaming Stick+ brings you 4K video with HDR in a compact package whose only potential disadvantage is that, since it doesn't have an HDMI adapter, it might be a bit of a challenge actually plugging it into some installations. This caveat is aimed mostly at those whose TV is mounted onto the wall, leaving little space for additional gewgaws; my 4K TV is on a stand, and so I didn't have any issues with the installation. And, to be fair, Roku's Canadian website says you can apply for a free HDMI adapter, which is a nice touch. I tried two different installations and they both worked fine. I stuck the Streaming Stick+ into a vacant HDMI port on the TV first, where it worked well (and I could power it via one of the TV's USB ports), and I also tried it plugged into the rear HDMI port of my Oppo UDP-205 4K universal player – and this time I tried powering it with the included USB/AC power adapter, where it also worked just fine. Using the Roku is child's play. Once you go through the one-time setup process, which is also simple, its clean and clear interface is easy to navigate with the remote control's cursor control keys. You'll have to add a credit card info before you can go nuts with it, in case you decide to subscribe to streaming services that require additional cash outlay, but in my experience using Rokus for at least a couple of years now I've never been charged for anything. Each subsequent Roku I've tried has logged into my original account, so once the initial setup is done (which doesn't require re-entering your credit card number), all the apps you have on your other Rokus show up automatically. The Roku "store" (from where you choose and install apps) is organized logically and you'll probably spend quite a bit of time navigating it, looking for apps you might find interesting. Installing an app is easy, and so is getting rid of apps that may have looked more interesting than they actually turned out to be (this happens to me all the time!). 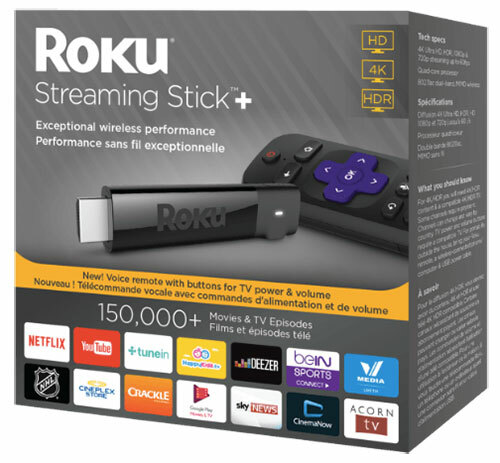 The Streaming Stick+ ups the features ante from some of the more "pedestrian" Roku streamers by offering a voice search that works quite well, and with which you can search for your favourite shows. The remote can also control your TV's power and volume. The Streaming Stuck+ works quickly – I tried it side by side with an earlier streaming stick and the difference was very noticeable – and I have had no issues with Wi-Fi range regardless of where in the house I tried it. I auditioned content that was all over the map when it comes to quality. And while even a Roku can't make a silk purse out of a sow's ear – and some of the content available looks like it predates VHS – with a great signal the picture looks terrific. Another nice thing about the Streaming Stick+ is that you can take it with you easily, so if you're travelling and staying in a hotel or Air BnB or something, you can take your Netflix account (or whatever else you've subscribed to) with you and use it in your room (assuming the TV there has an HDMI port you can get at). Roku claims that you can access more than 150,000 movies and TV episodes via its abundance of apps and I'd be a liar if I said I counted them all. Heck, I didn't count any of them because I'd never get anything else done. But between apps like Netflix, Crackle, Google Play, and the plethora of free apps such as My Retro Flix and Shout Factory TV, you'll never be without something to watch. Remember Stugeon's Law, though: "90 per cent of everything is crap", which means you'll be surfing by a lot of chaff looking for your audio or video wheat, but it's no worse than scrolling through the useless channels I get on my satellite TV service – and in fact there's a lot more on offer via the Roku than there is on the 500 plus channels of repetitious crap I get on TV. Roku also gives you stuff like a media player you can use to access the stuff you have on your home network. Or you can use apps like Plex, if they're your home streamer of choice. You name it, there's probably a channel. Heck, there are even ones that offer cat videos. There's car stuff, guy stuff, girl stuff, politics, comedy, etc.etc.etc. I'd be remiss if I didn't mention one of the apps I use the most: Accuradio. It's a streaming music service whose database of tunes offers a dizzying variety of genres, from the sublime to the ridiculous. There are classic rock channels, hip hop channels, Broadway, Canadian (it doesn't have to be good, it just has to be Canadian! I wonder if the CRTC ordered this…). Accuradio is also available for Apple and Android devices, and their website also offers streaming. Signing up is free, but there's no sign up for the Roku app version – and I've yet to notice a commercial on the Roku's Accuradio. Alas, while you can use your Accuradio account for the web, Apple or Android, to create your own playlists, you can't do this with the Roku version and that's a damn shame. There's also a Roku mobile app for your smart devices that lets you use your iOS or Android device function as, as Roku calls it, "the ultimate streaming companion." With it, you can control your Roku player, search with your keyboard, and access features such as "private listening," which lets you use your headphones to listen to the programming as loudly as you want without disturbing the insignificant other. You can also cast stuff to your TV via the app. Included in the box with the Roku Streaming Stick+ is the voice remote, the AAA batteries that power it, and a USB power cable with wireless receiver built in to help ensure you get no range issues. Roku also makes the Express, Premiere (and Premiere +) and the Ultra, the latter three of which also include 4K capability, though the Premiere doesn't do HDR and in my never humble opinion HDR is as important, especially with smaller TV screen sizes, as the 4K resolution of 3840 x 2160 pixels. Oh, if you're into Dolby Vision as your HDR thingy of choice, you're out of luck with this Streaming Stick+. I haven't noticed this to be a big deal as of writing this. And don't forget: if you want to watch 4K content via the Roku (or anything else), you'll still need a 4K TV. I'm a fan of Roku and its services, and have now tried most of their streaming devices. All work as advertised and offer a wonderful variety of great content, floating in an ocean of crap (the crap isn't Roku's fault, of course). Finding great content can be time consuming, and frustrating, but if you bear with it you can probably find some stuff that'll make you wonder how you lived without it. Or not. Naturally, in this as well as so many other things, the value of the content varies widely and your mileage may vary. But even if you're just looking for a way to get the Netflix and YouTube content you can't get on your "dumb" TV, a Roku can be a great purchase.